A History of George Mason University | Joseph L. Vaughan to Robert H. Reid, Robert C. Krug, Richard H. Pierce, and H. Mebane Turner, September 9, 1965. Memorandum from Joseph L. Vaughan, Chancellor of Community Colleges, University Virginia to Robert H. Reid, Robert C. Krug, Richard H. Pierce, and H. Mebane Turner of George Mason College. 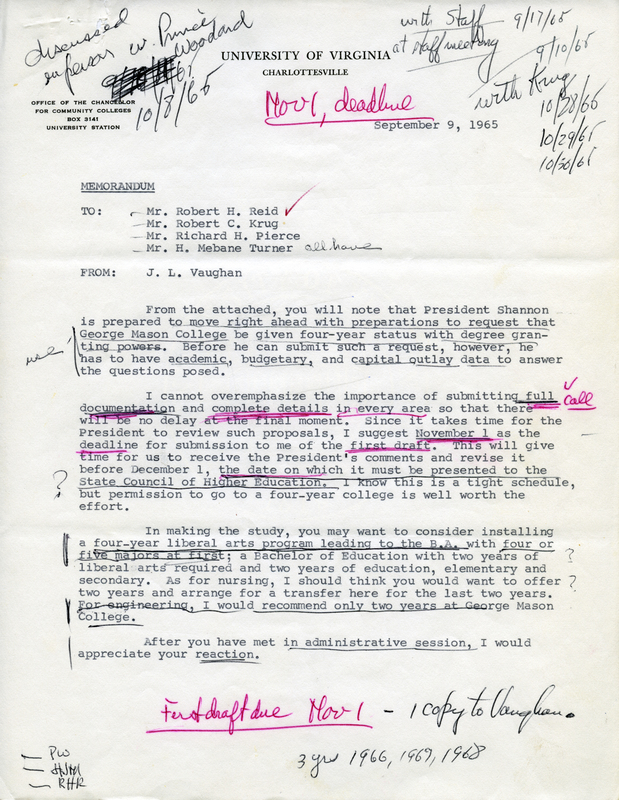 In this one-page message Vaughan requests information from the George Mason College administrators needed by University of Virginia president Edgar F. Shannon in order to begin the petitioning process for George Mason College to become a four-year degree-granting institution. The document is heavily annotated in what appears to be director Robert H. Reid's handwriting. One page. Creator : Vaughan, Joseph L.
Citation: Vaughan, Joseph L., “Joseph L. Vaughan to Robert H. Reid, Robert C. Krug, Richard H. Pierce, and H. Mebane Turner, September 9, 1965.,” A History of George Mason University, accessed April 21, 2019, http://ahistoryofmason.gmu.edu/items/show/103.